The hotel industry is getting increasingly digitalized. To cope with the guests’ increasing demand for digital solutions, hotels have to beat new paths. Many hotel owners as of yet don’t see the necessity for the digitalization of their hotels. This makes it even more important, to implement digital solutions and to grow with the digital world and this way be ahead of the competition. Directory: The directory makes every information regarding the Kameha Grand quickly accessable. 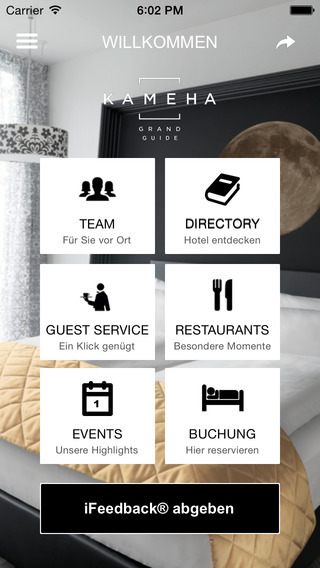 The guest can get information on the hotel’s services and his room, the opening hours and the restaurant’s menu, as well as ventures and services in the area. Team: Here the guest can get to know the Kameha team and the contact persons of the different departments. Guest Service: The Guest Service provides the guest with the opportunity, to directly express his wishes. If he/she needs for example more towels or wants to call a taxi, he/she can directly communicate his/her request and the team can immediately repond to this. Events: Brunch, sushi course, kitchen party, “Crime Dinners” and much more – the guest can find extraordinary events and special gourmet moments in the event calendar. Restaurant: If the guest is still deciding on which restaurant to visit in the evening, he/she can get inspired by the different opportunities and have a look at the whole menu. SPA: If the guest wants to get pampered by the hotel’s SPA team, he/she can find many wellness products offering exactly the relaxation he desires. iFeedback®: If the guest wants to rate the service of the hotel, he/she can provide his feedback to the chosen aspects via smartphone at any time. Social Media: Here the guest can get current news on the hotel and use the oportunity to share his experience and personal stories with the hotel. Contact: The “Just for You” service of the hotel is the guests’ contact with every matter. Here, the team can be directly contacted via phone or mail.